It’s bingo, but not as you know it. 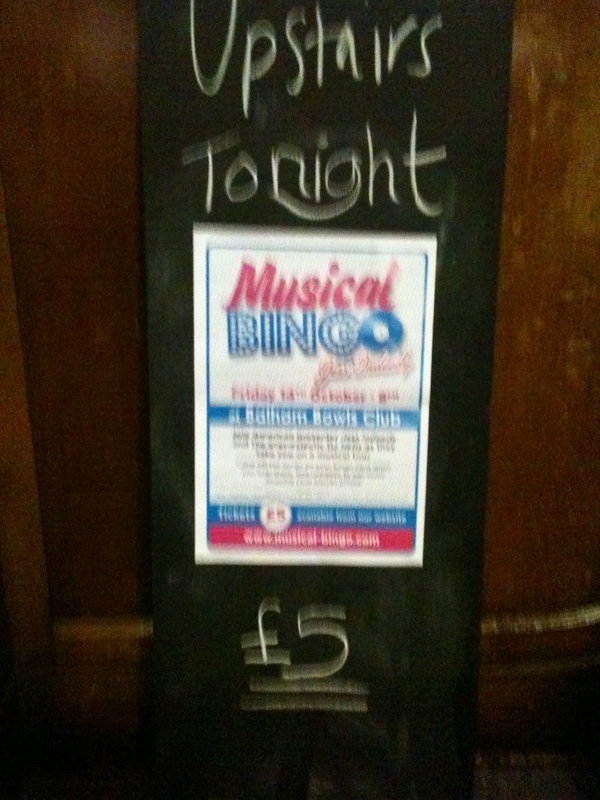 This Friday 18th November sees Musical Bingo make its second appearance in Balham, taking residence in the upstairs room at the Balham Bowls Club, reopened about two months ago in all its splendour (very keen on the birdcage lighting). We went to the first one there last month and we came away with a t-shirt, free dinner voucher and a hangover…. Host Jess Indeedy (really hope that’s her name, how very cool) and her hubby DJ Helix are the brains behind this classic game with a twist. Don’t expect this to be a hush-hush game with eyes down; you’re actively encouraged to dance and sing along to the tunes being belted out, running up to the stage once you’ve achieve a line/full house. We had three rounds; 80s, ‘Punch Drunk’ and dance classics. Team SwishJunction did very well indeed, scoring a dinner for two at the BBC (more on that later), a bottle of wine and a money-can’t-buy (oh alright, you can on their website, but still!) 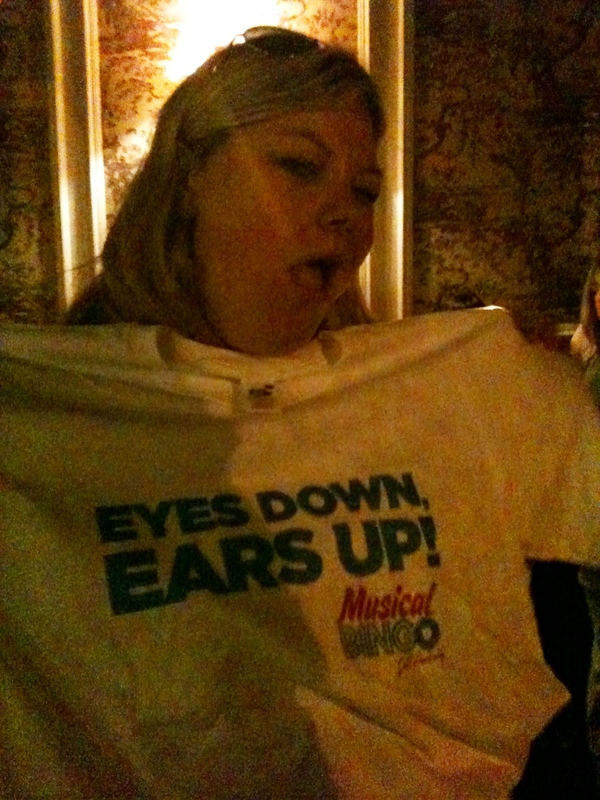 Musical Bingo t-shirt, as modelled by the lovely Liz of Balham. Jess Indeedy’s enthusiasm becomes more infectious as the night continues and certainly works the crowd. They’re back at the BBC this Friday. Don’t miss it. Enq. www.musical-bingo.com. Tickets: £5 online, £7 on the door. Hi Jonny, thanks for your comment, certainly interesting to hear. Get yourself down to Balham and we can review you too then! Johnny Unknown – Unknown, how apt, since we don’t see you down at the BBC up on stage entertaining us and giving us a really good night. Life is about running with ideas, your owns or someone else’s, if you snoozed, you lost…. That girl… yuk!!! Can’t stand her falseness. Speaking on behalf of Shoreditch House, I can testify to being a victim of Jess’s frankly DISGUSTING attitude. She appears to be so nice and lovely upon first meeting but it won’t be long until the cracks show…as well as that vile nature of hers… Go home! Thanks for the comment, it’s really interesting to hear all sides. At SwishJunction we blogged about Musical Bingo with Jess Indeedy simply because we thought the concept was slightly different and a fun way to spend an evening down the pub, and Jess and Helix certainly entertained us. We’re an independent blog (check out our views on Eastern Empire for a good example) so these opinions are entirely our own and until we experience otherwise, we stand by our blog. Thanks so much for reading. SJ. Hello Jonah316, I’m sorry but l don’t believe life is about stealing other people’s ideas. Be inspired yes, but think up your own creations, your successes will be all the more rewarding. Jessica Brockbank own night’s have always been a massive flop, but taking a formula to create a carbon copy and confusing people in the process is no way to go about it. You’re welcome down to Musical Bingo anytime to see myself + The Team’s larger than life persona, You’ll then understand the irony and pseudonym in the name ‘Unknown’ . I’m really not trying to make enemies, I’m just letting people know the truth. The extent to which this girl goes…what fraud.